The market of e-Commerce platforms has got to the point when it’s even hard to tell how many solutions are there nowadays - a hundred, two or more? However, one thing is clear - competition is never bad for customers. Being a hotbed of innovation and progress, competitive market is what makes e-Commerce solutions grow, develop and improve. And if the emergence of a perfect shopping cart requires the creation of a million of mediocre ones - let it be. We’ll wait. Magento and OpenCart are among those platforms that have a potential for becoming if not perfect, then very approximate to this definition. Both powerful and popular, they go hand in hand in terms of functionality and basic capabilities. That’s why the choice Magento vs OpenCart is not an obvious one, and mostly depends on personal preferences and requirements rather than objective causes. Generally speaking, those two e-Commerce solutions have a lot in common. Both Magento and OpenCart are open source, developed in PHP, and free-to-download. Supporting multiple languages and currencies, each of them has gathered huge user & developer communities, which resulted in the creation of numerous custom extensions. Both platforms are powerful and functional enough to power stores of nearly any scale and fairly comprehensible. One of the greatest differences between those two platforms lays in the management simplicity, or rather to say, the lack of it in Magento. Indeed, Magento’s learning curve is steep enough to confuse an average user and requires some amount of programming knowledge and technical expertise. As the result, quite often store owners are forced to hire a developer. But as soon as Magento gets into a skillful pair of hands, this shopping cart is able to do about anything an e-merchant can dream of. Fully customizable design, utter flexibility, unlimited SEO resources and a countless number of extensions - that’s how Magento justifies its complexity. On the contrary, OpenCart is considerably easier to use and manage. Straightforward and intuitive, it’s able to get a business rolling within a few hours of setting it up. The lightweightness and simplicity of OpenCart, however, will cost you about 20% of functionality Magento users are so proud of. This, basically, what lowers OpenCart demand among owners of big-sized stores, but gives an advantage in competition for powering the smaller ones. Magento, on the other hand, is often considered to be “too much” for shops with a moderate product quantity, and a perfect match for bigger online retailers. As for support, both Magento and OpenCart have nurtured robust communities always ready to help a merchant in need. The number of Magento specialized programmes is incomparably bigger though, which is related to high technical requirements this platform imposes. However, quantity has nothing to do with quality, right? Nothing goes for nothing. Even though Magento and OpenCart are free to download and use, you’ll still need to pay for hosting, extensions and premium templates. Magento, however, will cost you considerably more. Being a resource-demanding solution, it requires a strong (and expensive) hosting plan to support your store performance. Additionally, you’ll need to pay from $79 to 179$ for most of design templates and up to $1000 (!) for a single extension license. Such exorbitant price is, of course, more of the exception than the rule. On it’s side, OpenCart is much more lightweight, which means hosting expenditures will be less. Themes are also nearly twice as cheap compared to Magento ones, not to mention moderate extensions prices. This fact, however, results in a relatively humble variety of choice of the templates and plugins offered. Which platform is better? That depends. While OpenCart is great if you’re trying to build a store on your own with minimum financial infusions, Magento is a perfect choice for bigger stores with bigger budgets. However, both shopping carts are good for what they’re designed to do - selling and bringing profits. Already have an online retailer built with OpenCart but planning to move to Magento? 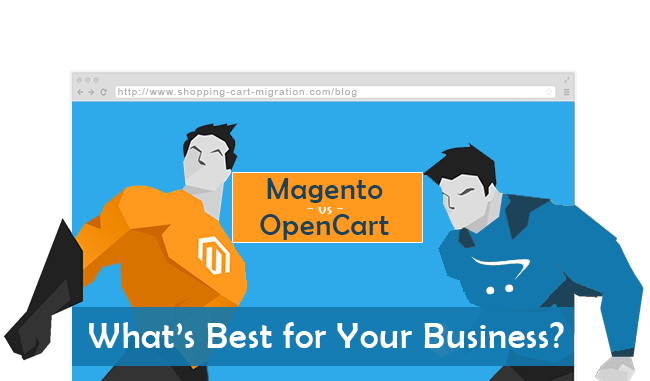 Migrate from OpenCart to Magento swiftly and easily using Cart2Cart. Or are you willing to do vice versa by switching from Magento to OpenCart? Automated Cart2Cart is still exactly what you need! 2 thoughts on "Magento vs OpenCart - What’s Best for Your Business?" Thanks a lot for your kind words! Please, don’t forget to share the post you like most of all. Hope to hear from you soon!